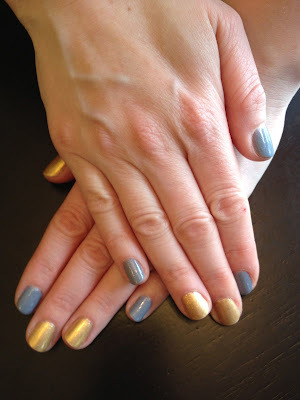 The Beauty of Life: My Recent Mani: Chanel Gold Fingers and OPI I Don't Give A Rotterdam! My Recent Mani: Chanel Gold Fingers and OPI I Don't Give A Rotterdam! I visited some friends in Bloomington over the weekend (my alma mater, Indiana University, is there! Go IU!) and I simply had to give myself a fabulous manicure for the trip. I decided on Chanel Gold Fingers and OPI I Don't Give A Rotterdam!, and I really like the combination of the bold gold with the shimmery dusty blue. I like that the flecks of gold glitter in the OPI perfectly complement the bold gold of the Chanel. I actually meant to paint different nails with each color on each hand, not to have the middle and ring fingers be the same -- but by the time I realized my mistake, I had already applied a top coat! Each of these colors went on smoothly and evenly with no streaks. I applied two coats, but they both looked fantastic in just one. I'm especially loving the Chanel, which is so different than all the other golds Chanel has come out with. It's liberally packed with sparkle and is a true opaque gold, unlike Gold Fiction (a yellow gold) or Illusion D'Or (more of a finishing coat than an actual polish). Truth be told, I painted my nails on Wednesday and still haven't changed them for this week, because I just love them so much! But I'll probably be changing them right after I finish writing this post ... so, now! Another reason to like you/your blog, I'm a Hoosier too... not an alum of IU, but born and raised in Indiana!